Northumberland is a place of big skies and beautiful vistas. There’s an incredible variety of landscapes here — vast, sandy beaches, rugged islands teeming with seabirds, the remote northern moors, the windswept Cheviots and the dark skies of the Kielder Forest Park. 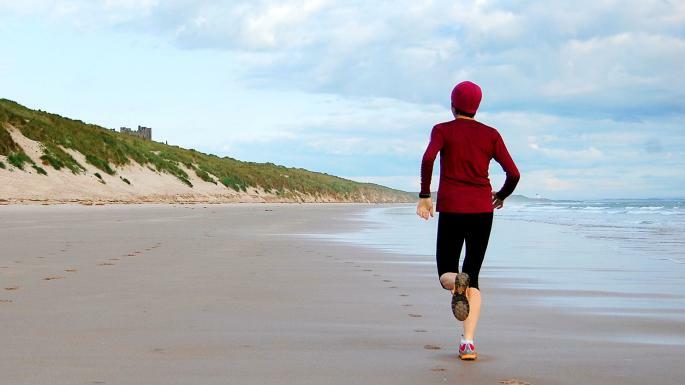 It’s a wonderful, wild place to run, with several long-distance trails, including the coast path, which edges the length of the Northumberland area of outstanding natural beauty (AONB). A stunning out-and-back run on firm, wave-washed sand, which can be linked to St Oswald’s Way and the Northumberland Coast Path. Take in the views out to the Farne Islands and their 70,000-strong puffin colony and, farther north, Lindisfarne on Holy Island. From the start, scale the dunes and drop down on to the beach at its southern end. Head north and run the length of the sandy section of beach until you reach the rocks below the castle at Bamburgh. Return the same way. Variations can be explored along the dunes or inland on the coast path. St Ives has some of the best coastal running in the country. The South West Coast Path passes through the town on its 630-mile waymarked journey from Minehead in Somerset to Poole in Dorset. From Porthminster follow the signed South West Coast Path north and out around St Ives Head. Continue on the coast path heading west, skirt Porthmeor beach before ascending to the headland at Burthallan. Follow the clear trail around Clodgy Point, Hor Point and Pen Enys Point, finally ascending to the trig point at Trevega Cliff. From here, turn left, leaving the coast path and heading inland, following a footpath south to reach a path junction. Turn left at the junction and head east, passing through several farms to reach Burthallan Lane. Turn right on to the lane and follow it back into St Ives, descending through the town and back to the beach. Our route loops the Treginnis Peninsula, including a spectacular section of the 870-mile Wales Coast Path. The winding, rocky trails have glorious views. Take the quiet road right, heading inland and turning left at the crossroads. Where the road ends follow tracks and paths north past the great rocky outcrop of Carn Trefeiddan before heading seaward along a road to St Justinian. Join the coast path heading south, with glorious views out to Ramsey Island. This section has technical ascents and descents along an exciting single track. 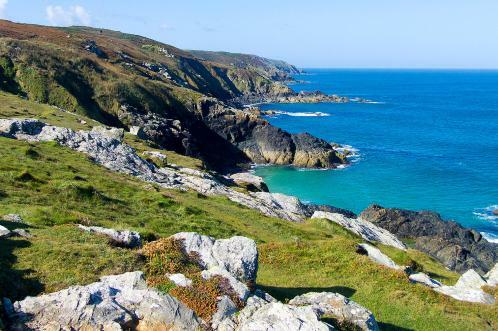 The final stretch winds through coastal heathland, filled with wildflowers in spring and purple heather in summer, before dropping down to the rocky, secluded cove of Porthlysgi. Continue on the coast path to return to Porth Clais. The Torridon Hills lie on the shores of Loch Torridon. This run takes you into a spectacular mountain landscape between Liathach, Beinn Alligin and Beinn Eighe. This circular run loops round the 1,055m (3,460ft) mountain Liathach, taking in the loch shore, cascading waterfalls and deep corries (basins). Follow the quiet road west through Glen Torridon. At the countryside centre bear right on to a lane and follow this to where it crosses the river Abhainn Coire Mhic Nobaill. Turn right here and follow the river, heading east along the coire to Loch Grobaig. From here continue southeast, following the main trail and the river back to the start. The Peak District has everything from fell runs through the high moorland of the northern Dark Peak to gentle excursions through the wildflower-filled dry limestone valleys of the White Peak to the south. This follows the scenic Long Route, marked in green on maps available at the visitor centre. Turn right on to the main driveway, heading northeast to reach the B6521. Cross over and head northwest along a path through woodland. At Burbage Brook turn left and follow the path along Padley Gorge. After a mile turn left, heading south uphill and turning right on to a road. Take the next left up a lane into Nether Padley and follow this uphill, continuing southeast on a footpath through woodland. Leaving this, head east, crossing the road and continuing along a footpath to a copse. Turn left at the next path junction and head northeast across White Edge Moor. Cross the A625 and continue on a footpath northwest back to the visitor centre. As you run along the soaring chalk ridge, with views out across to the Needles, it’s easy to see why the western side of the Isle of Wight is an AONB. Facing the quarry, take the left-hand path out of the car park and head south, climbing steeply uphill to reach the coast and the Tennyson monument. Turn right here and follow the coast path to the coastguard station and the Needles viewpoint. Round the headland at the Old Battery and follow the coast path as it heads towards Alum Bay. When you reach the road at Needles Park, leave the coast path and continue straight on, following footpaths west to return to the start. For the second loop, follow the Tennyson Trail along the coast west until you reach a road at Freshwater. Turn left and follow the road until you can turn left on to a footpath; follow through the valley and back to the car park. The Chilterns AONB covers 324 square miles of countryside between the Thames in southern Oxfordshire and Hitchin in Hertfordshire. The rolling chalk escarpment of the Chiltern Hills is a great place for a run. Exit Tring station northeast and turn right on to Station Road. Follow this past a right-hand turn until you can turn left on to the waymarked Ridgeway national trail. Continue along the Ridgeway through Grim’s Ditch, joining with the Icknield Way before ascending to the trig point at the summit of Ivinghoe Beacon. Turn right here and follow the obvious ridgeline to Gallows Hill, descending steeply to join and follow the waymarked Boundary trail south to meet the Icknield Way. Follow this through woodland until it reaches Ward’s Hurst farm and turns sharply left. Leave the Icknield Way here and continue straight on. At the reservoir, shortly before Ringshall, turn right, cross a road and follow paths through woodland to reach Aldbury. Rejoin Station Road or follow the Hertfordshire Way to the station. Expansive moorland tops are scored through by deep river valleys, the Yorkshire Dales themselves, and crags form impressive fortresses along the hillsides. 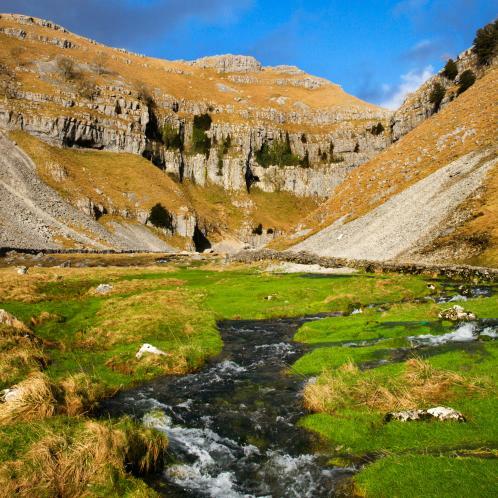 Our route takes in one of the dales’ most famous landmarks, Malham Cove, a great scoop of limestone formed by glacial meltwater about 50,000 years ago. Turn left and run through the village, following signs for Malham Tarn until you reach Malham Cove. Follow the Pennine Way up the steps to the top of the cove for great views across Malhamdale. Cross the limestone pavement and go over the stile, bearing right uphill, following posts with green dots on. Continue straight on to join the road, following signs for Gordale Scar. Head downhill and left on to the road, continuing over Gordale Bridge, and turn left through gate. Follow the path through the campsite to Gordale Scar. From here, retrace your steps back to the road and over the bridge, continuing until you reach the riverside path to Malham. Follow this past Janet’s Foss waterfall to return to Malham. The Peddars Way and Norfolk Coast Path combine to form a 93-mile waymarked national trail, starting inland before following the coastline to Cromer. From the car park follow the wooden boardwalk through pine trees towards the sea. At the beach, turn right and follow the wide, sandy arc of the bay all the way to Wells-next-the-Sea. To return, wind your way through the streets of Wells to reach a lane into Holkham estate, entering to run through woodland and past the hall, ice house and lake to the main entrance, before returning to the start. Ullswater is the second largest body of water in the Lake District after Windermere. Carved by a glacier that flooded the valley as it melted, Ullswater lies cradled within surrounding fells. Our run takes in the full eastern shore, between Glenridding and Pooley Bridge, with a steamer ride to return to your start point. It can also be split into two sections — Glenridding to Howtown (6½ miles) and Howtown to Pooley Bridge (5 miles). 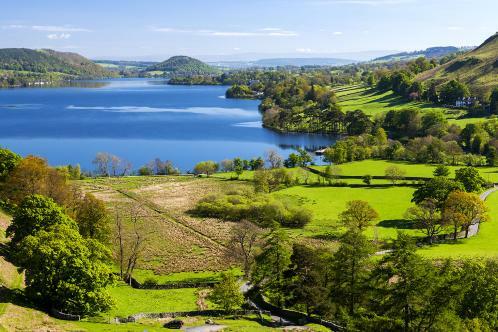 For a longer route, the waymarked Ullswater Way runs for 20 miles round the lake. The section from Glenridding to Howtown was described by Alfred Wainwright, the walker and author, as “the most beautiful and rewarding walk in Lakeland”. The section from Howtown to Pooley Bridge crosses farmland and open fell, with a short section of road between Cross Dormont and Waterside House. The long, deep valley of Great Langdale is bordered by the famous Langdale Pikes, with the 80-mile Cumbria Way running through its centre. A lovely quiet run through Great Langdale, starting and finishing by Langdale Beck, or, if flooded, the well-signed Cumbria Way. From the start, follow Langdale Beck downstream. Run beside Elter Water, with the Langdale Pikes as its stunning backdrop. Follow the River Brathay from Elter Water towards Windermere. At Kirkstone Gallery head north, taking in an anticlockwise loop round Loughrigg Tarn, a favourite place of William Wordsworth. Cross on paths through Little Loughrigg before a fantastic, long descent that leads back down to Elter Water. Turn right when you reach the lake to follow Langdale Beck and the Cumbria Way back to the start. The ten-mile Snowdon Race is a classic on the fell running calendar and billed as one of Europe’s toughest endurance challenges. Our run follows the same route, the Llanberis Path, which is the most popular way up the mountain. From the A4086 through Llanberis follow Victoria Terrace southwest. After a mile, turn left on to the Llanberis Path, following waymarkers southeast to ascend towards the summit of Snowdon. At about four miles there’s a path junction that, although signed, can be missed, especially in poor visibility — continue south here towards the summit. The return trip is by the same route, again taking care to continue northwards at the path junction. There are many other routes up Snowdon that vary in length, interest and technicality — for those looking for a bigger, more serious challenge, the seven-mile classic ridgeline of the Snowdon Horseshoe is an exhilarating and thoroughly enjoyable run. 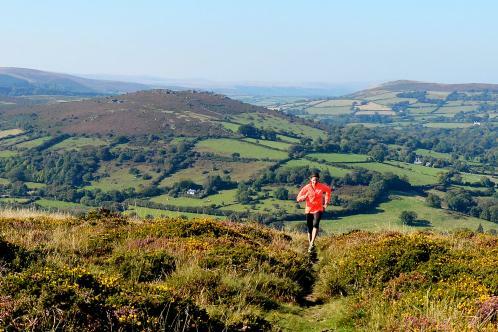 Dartmoor covers 368 square miles of glorious Devon upland. Wild ponies graze the windswept moorland and deep, wooded valleys channel the region’s many rivers towards the sea. From the visitor centre head north, to the right of Haytor’s rocks. Continue north, following the ridgeline past Smallacombe Rocks to reach the obvious large cairn on Black Hill. Turn left at the summit and descend into the valley on clear, grassy paths to reach trees and a stream. Cross the granite clapper bridge and go through a gate, climbing steeply up the other side to reach another gate. Go through this and run to the right of the sharp outline of Greator Rocks. Turn left immediately after Greator, following a clear path over a stile and descending to a second clapper bridge across the stream. Scramble up a rocky ascent on the opposite side to reach the disused quarry at Holwell and join the granite tramway. Follow this until you can turn right over Haytor Rocks and descend to the visitor centre. The National Trust’s Castle Ward is an 18th-century mansion nestled in rolling countryside on the edge of the peaceful waters of Strangford Lough, the largest sea inlet in the British Isles. The Boundary Trail is waymarked throughout. From the car park by the lough, follow the shore trail north round Strangford Bay. This section of the trail is shared with horse riders and cyclists. Passing Audley’s Castle, the route heads back on itself for a short distance before heading away from the lough and farther into the estate. Follow the trail through woodland to reach Mallard Plantation. Continue through Base Camp and Windmill Plantation. Finally, cross the deer park and return to the start. There’s lots to do for families at Castle Ward, and several of the trails are suitable for running buggies and bikes too. The island of Skye is the largest of the Inner Hebrides. The weather is notoriously fickle, and any run into the mountainous regions should be undertaken with this in mind. This run takes you from the campsite at Glen Brittle right into the heart of Coire Lagan, a great, rocky amphitheatre bordered by towering gabbro crags, including the famous Inaccessible Pinnacle, part of the classic Cuillin Ridge Traverse. From the campsite take the path east as it climbs eastwards into Coire Lagan. Continue east along the path, looping clockwise round the tiny loch that lies in the hollow at the base of Sgurr Mhic Choinnich. Return along the path heading west to the base of the coire, joining the path heading northwest along the north side of Loch an Fhir-bhallaich to Glen Brittle.